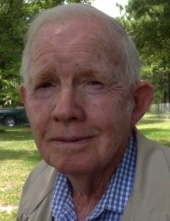 James Elbert “Spoke” Coleman, 84, of Moss Point, MS, went to be with the Lord on November 17, 2018. He was born May 31, 1934 in Hurley, MS, to the late Alamandra and Lena Coleman. James worked for Mississippi Export Railroad for 42 years as a Bridge Tender. After he retired he still kept himself busy with cutting fire wood and recycling. Spending time with his family and grandchildren was what he liked to do best. James is preceded in death by his parents and son, James David Coleman. He is survived by his loving wife of 66 years Katherine Coleman; daughter, Shirley (Wayne) Blacklidge; granddaughters, Stefanie (Craig) Willis, Traci Blacklidge, Jennifer (Rob) Clem and Angela Painter; 9 great-grandchildren; 2 great-great grandchildren; sisters, Betty (Bob) Powell, Linda Tapper and Evelyn Cothran ; brother, Robert Coleman; along with numerous nieces, nephews and family members. The visitation for James will be held on Tuesday, November 20, 2018 from 2:00 p.m. until 3:00 p.m. at Canaan Assembly of God Church in Moss Point, MS. The funeral service will begin at 3:00 p.m. with Bro. Rodney Coleman officiating. Interment will follow at Evergreen Cemetery in Helena. Pallbearers will be Craig Willis, Nicholas Greer, Adam Mason, Melvin Holder, Billy Deal and Wayne Blacklidge. Honorary pallbearer will be Blade Willis. In lieu of flowers the family requests donations be made to Canaan Assembly of God Church. To send flowers or a remembrance gift to the family of James Elbert Coleman, please visit our Tribute Store. "Email Address" would like to share the life celebration of James Elbert Coleman. Click on the "link" to go to share a favorite memory or leave a condolence message for the family.